1, with 13 abstentions. Even more astounding is the fact that only 10 of the 42 resolutions passed by the Council singled out the actions of any one particular country. Of these 10 resolutions, five targeted the State of Israel. Indeed, 50 percent of country-specific resolutions centered on one of the smallest member states of the UN — and one which happens to have the best human rights record in the Middle East. Now, the UNHRC is preparing to appoint the next UN Special Rapporteur for Human Rights in Palestine. 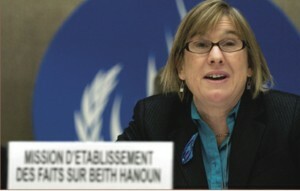 The purported role of the Special Rapporteur is to investigate the human rights record of Israel on behalf of the UN. However, these “investigations” historically lack any semblance of objectivity. Notably, for the last six years, Princeton University professor Richard Falk has used this official UN position to promulgate his long-held virulent anti-Israel views. In anticipation of Falk’s departure from the post, many hoped that the UNHRC would install a neutral, or at least a less biased academician. Such is not the case. The new Special Rapporteur is Christine Chinkin, who served on the infamous Goldstone Commission and is known to be biased against Israel. The very issuance of the Goldstone Commission’s con- demnatory report on Israel was shameful, as evidenced by it being widely discredited by an over- whelming majority of both Democrats and Republicans in Congress; the European Centre for Law and Justice; the Simon Wiesenthal Center; and reputable news organizations including The Wall Street Journal, The Economist, The Times (UK) and The Washington Post. In fact, the inaccuracies in the report proved so outrageous that Richard Goldstone, head of the commission, publicly distanced himself from its key conclusions. The selection of Chinkin by the UNHRC demonstrates that a corrosive bias against Israel continues to permeate the UN system. In the forum at Geneva, proper protocol is of high importance. In this world of multilateral and multi- national institutions, the official statements of the U.S. Ambassador to the UNHRC substantially affect public perception. Because of this, an empty seat at the table dangerously compromises U.S. efforts to promote human rights and argue for equal treatment of all states. The President has nominated Keith Harper to be U.S. representative to the UNHRC, but the Senate has yet to confirm the nomination. As I previously wrote in this newspaper, I believe that Harper’s record as an exemplary civil rights and human rights advocate for Native Americans makes it clear that he is highly capable of advancing the interests of the U.S. in promoting and protecting human rights throughout the world. He has repeatedly defended good and opposed evil in UN institutions. Memorably, Harper walked out of the UN World Conference Against Racism in Durban, South Africa, in 2001, in solidarity with those of us who vocally countered the anti- Semitic, anti-Israel and anti-Zionist hate-fest held under the UN banner. These battles at the UN generally and the UNHRC specifically are not going away. Every day new challenges emerge. Preparatory meetings are now underway in earnest for the next UNHRC session. The issues are too important to allow the Harper confirmation to languish; we need his voice and his leadership as U.S. Ambassador at the UNHRC in Geneva. Moreover, Israel has been granted entry into the Western Europe and Others Group (WEOG) at the United Nations, and has returned to the UNHRC itself. This presents a real opportunity for the U.S. and Israel to collaborate and move forward a proactive Council agenda on a whole host of issues including women’s rights, gender equity and protection of children. Built on a foundation of shared Western values, Israel is the United States’ closest ally in the Middle East and one of America’s greatest allies in the world. Furthering an agenda based on our common objectives will aid in regularizing Israel’s role at the Council. U.S. leadership at the highest levels is necessary to ensure the ultimate success of these initiatives. The UNHRC can with coordinated effort hopefully be refocused on a positive agenda instead of its blind political warfare against the State of Israel. Although limited progress has been made, far more must be achieved. As I wrote in my Feb. 28 piece, “the UNHRC needs a strong and immediate U.S. presence … to fight against the evil-doers of the world who skate from responsibility on the issues of human rights and the dignity of all men and women. The inverted morality which permeates the UN cannot be countenanced by the U.S. Silence and absence is never acceptable.” This remains true today. It is our responsibility to speak up in defense of basic human rights and dignity for all. And it is our responsibility to be troubled that the principal international body entrusted with promoting human rights —the UNHRC — is morally compromised. If the commission is to become an instrument for promoting the greater good, the U.S. must provide strong and effective leadership. Keith Harper will bring that leadership. In addition to being good and right, the upcoming UN World Conference on Indigenous Persons being scheduled for September 2014 makes having Harper, a Native American leader, as our Ambassador quite timely. His heritage illustrates the progress our own country has made in securing the rights of indigenous peoples on this continent. We must urge the Senate to confirm Harper immediately so he can get to work in advancing the U.S. human rights agenda in the world forum. With the UN having designated 2014 as the year of alestine, and in anticipation of the Palestinian Authority renewing its efforts for unilateral recognition at the UN, another hate-fest against Israel looms on the horizon. We need to be proactive in representing our cherished values. Let us not be silent. Let us speak up — loudly, clearly and strongly. Richard D. Heideman is a Washington, D.C. attorney. 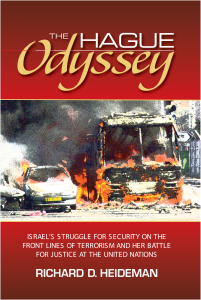 He is the author of The Hague Odyssey: Israel’s Struggle for Security on the Front Lines of Terrorism and Her Battle for Justice at the United Nations (Bartleby Press; see thehagueodyssey.com). He can be contact- ed at rdheideman@richardheideman.com.